Our topic on March 29th will be the Green New Deal, a proposed economic stimulus program in the United States that aims to address both economic inequality and climate change. 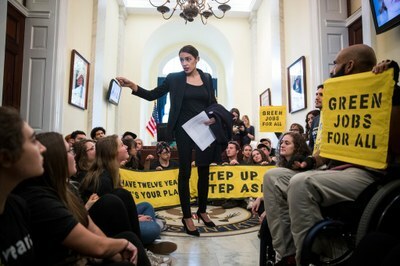 Supporters of a Green New Deal, like Hart and the youth-led Sunrise Movement, advocate for a combination of Roosevelt's economic approach with modern ideas such as renewable energy and resource efficiency. Hart Hagan is a long-time activist, organizer, and advocate for sustainable change. He is host of The Climate Report on Louisville's Forward Radio 106.5fm, and director of Wild Ones Louisville. The Sustainability Council’s EcoReps program is designed to move students, faculty & staff beyond talk to action for a more sustainable UofL! We provide basic training & resources, service opportunities, and leadership positions as a point-person & peer-to-peer advocate for sustainability. This spring, we continue our series of in-person workshops each month on last Fridays at noon in Ekstrom Library room W210. Join us for lunch and bring your reusable plate, utensils, and cup to minimize waste! All are welcome. More info on EcoReps website.